Whenever we book a Carnival Cruise, the first thing I do is make reservations at Carnivals Steakhouse for our first night at sea. 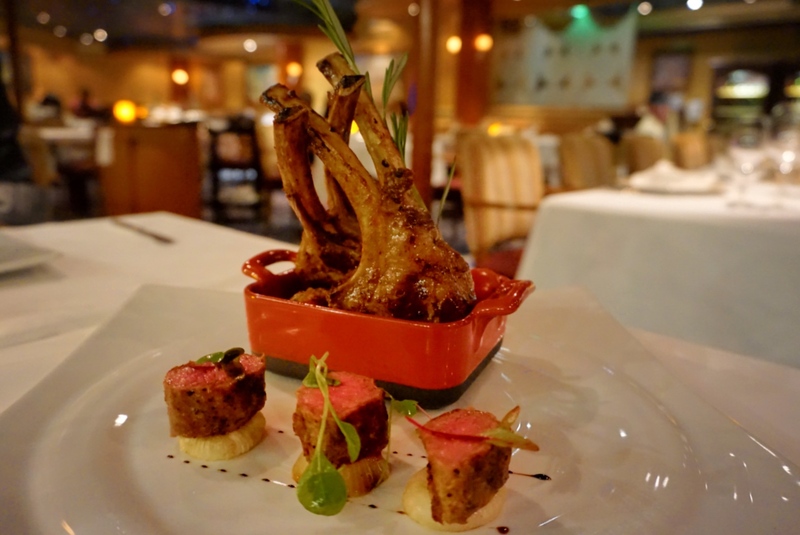 Having a delicious, memorable experience is the best way to to kick off your vacation. 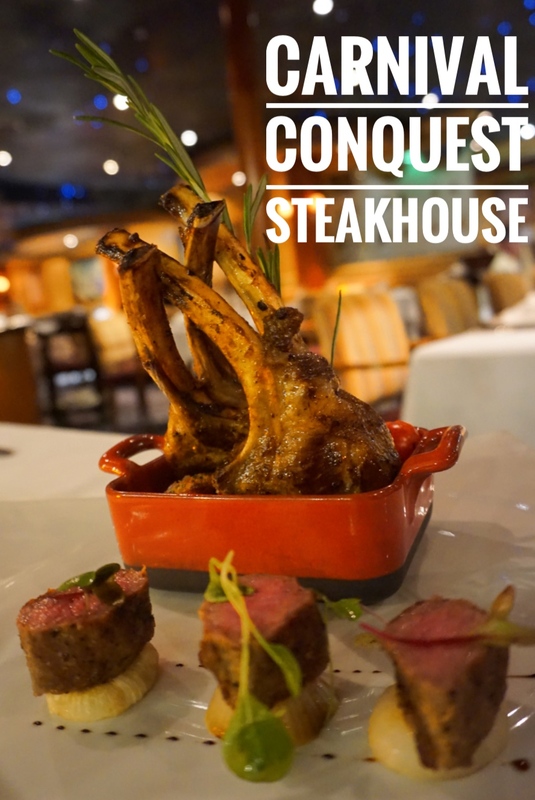 The Steakhouse on Carnival Conquest is an additional fee of $35 per person. This will get you a starter, salad, main entree and desert. Not a bad deal at all!! If you're a wine lover like yours truly, I strongly suggest booking your meal on the first night as they offer a free bottle of house wine OR half off any bottle of wine. 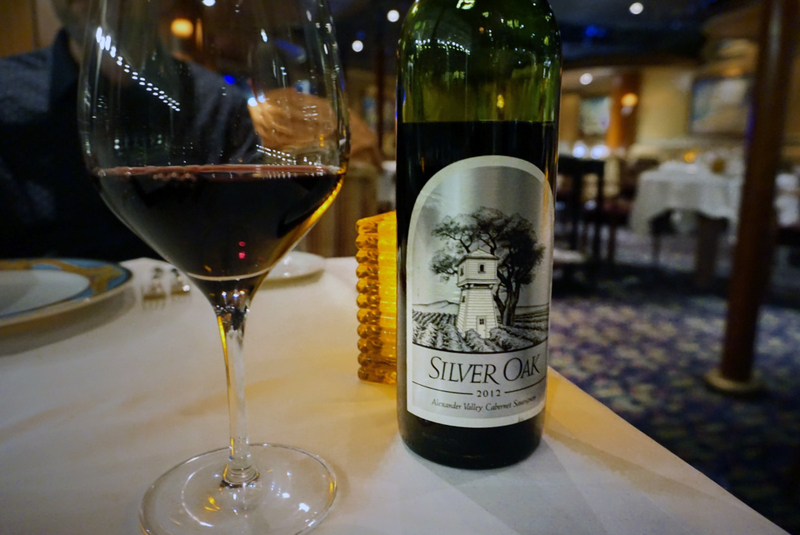 That's right friends - this lovely bottle of 2012 Silver Oak only set me back $55. Carnival Steakhouse is the proud recipient of the coveted Award of Excellence from Wine Spectator Magazine, bestowed upon approximately 2,400 restaurants each year. 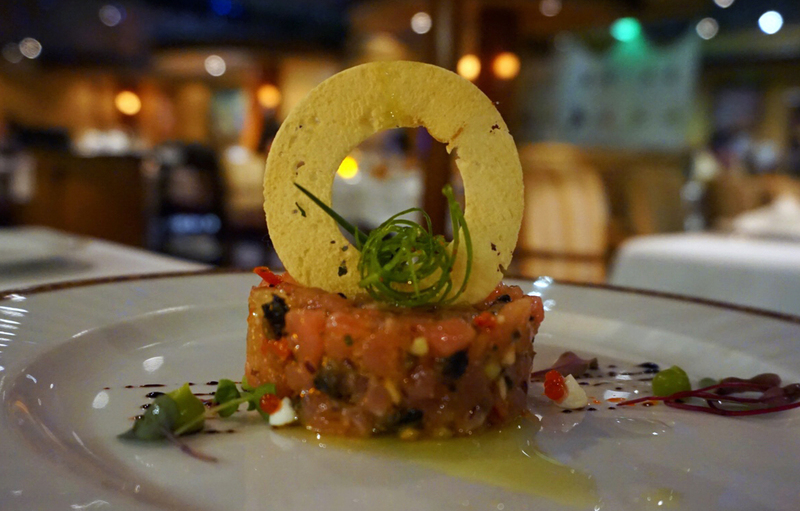 For our starters, I ordered the Ahi Tuna Tartare. It was delicious dices of sashimi grade yellow fin tuna belly, full of flavor and I would absolutely recommend this to anyone who loves tuna! 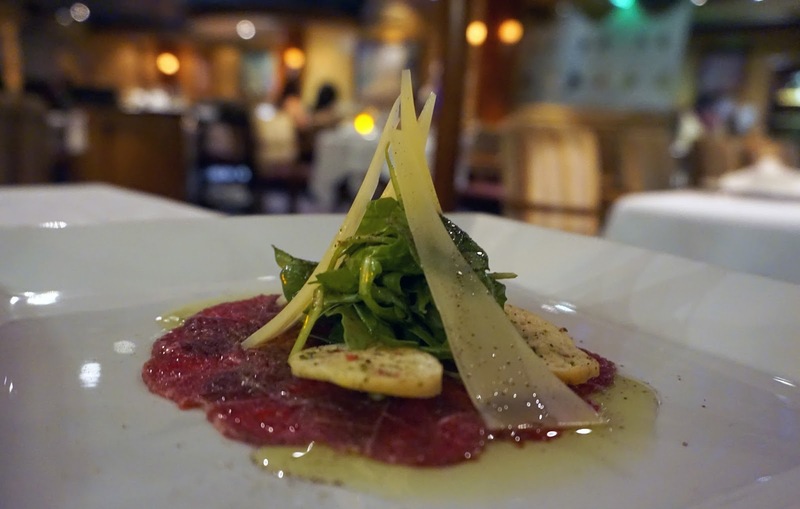 Gabe got the Beef Carpaccio which consisted of thinly sliced raw beef tenderloin and shaved Parmesan cheese. This particular one had unadvertised truffle oil on it - um yes please!!!!! I stole a small bite and it was fantastic. Carnival Steakhouse will allow you to substitute a salad for an additional starter and Gabe did just that with the Lobster Bisque with Vintage Cognac. 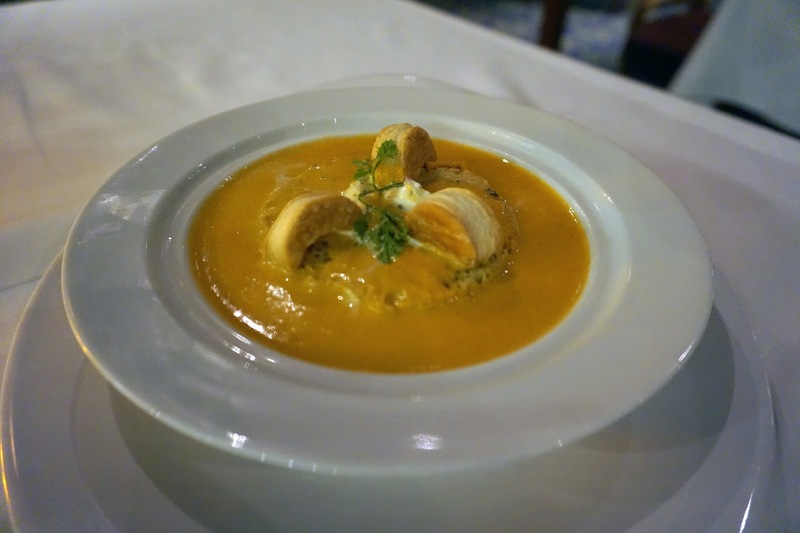 My husband is a lobster bisque connoisseur and said this was top in his book (I agree 100%). 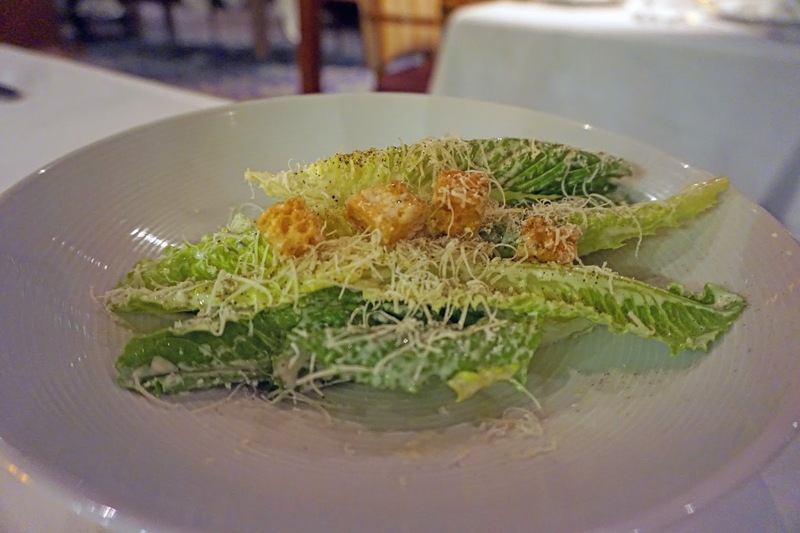 I went with a Classic Caesar Salad which was prepared at table side. It had the perfect amount of flavor and not too much dressing. This was not a soggy salad my friends! While I was very excited about dining in the Steakhouse, I had one problem....I am not eating steak at the moment. I didn't turn vegetarian or anything like that - but steak and I haven't been the best of friends lately. So instead of ordering my go to at the Steakhouse (surf and turf), I ordered the Australian Double Cut Lamb Chops and for the first time in a while, I was thankful for my steak aversion. This was hands down the best lamb dish I've ever had!!!!! Gabe ordered the Cowboy Ribeye, a 18oz monster piece of meat. It surprised us a bit when we were told the recommended cooking temp was Medium - this was to do with the amount of marbleization. Gabe was very happy with the outcome of a cooking temperature we would typically never order. For our deserts, we both ordered the cheesecakes to-go which I may have had for breakfast the following day. Never, I repeat, never skip the dessert. They offer it to go and many of the cruise ships have mini fridges in their rooms. Overall, this was a fantastic meal. On this sailing, I overheard a people people say they wouldn't pay additional for a meal since the food on the ship is free. However, if you're a fan of going out to dinner, this experience is well worth the minimal cost. We've spent over $200 for a meal that wasn't near this quality and quantity. Plus the dining room is just like a normal restaurant and you have a nice quiet night to yourselves. 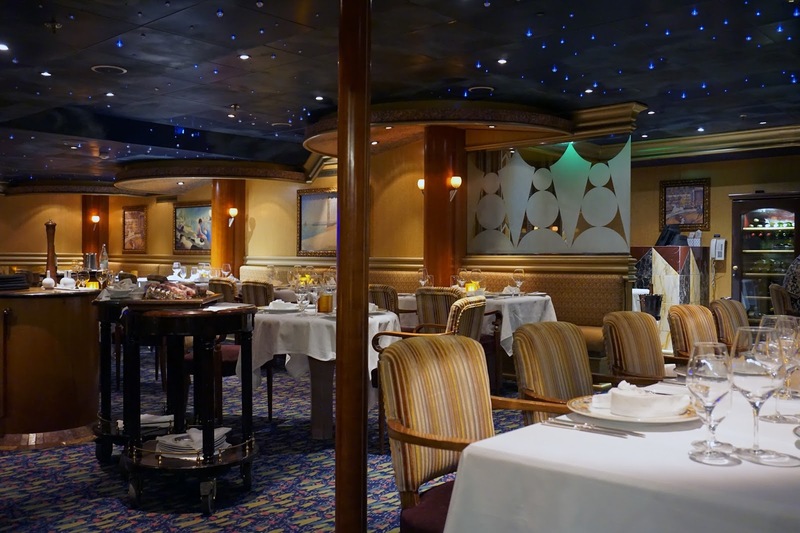 Lastly, Carnival is in the process of revamping many of their menus, steakhouse included. I was able to snag pics of the new Steakhouse Menu to be rolled out over the next few months. I was happy to see they kept the Tuna Tartare. There are quite a few new additions and modifications to the starters - the Beef Carpaccio is being replaced by a Bone Marrow & hand cut Beef Tartare. There are now Oysters (!!!) but most impressive is on the entrees - 10oz A-5 Wagyu! I WILL be over my steak aversion by the next time I cruise on Carnival. What do you think about the new menu offerings? Special thanks goes out to Carnival for hosting me and my husband on this cruise. I was not compensated to write this post and all opinions are my own.